That whole "Brother's keeper" thing. The MHS Academic Team. From left: Scott Ellis, John Price, Pearson Kelly, Chris Cross and Kyler Drury. This group of teenagers might have just started a revolution. 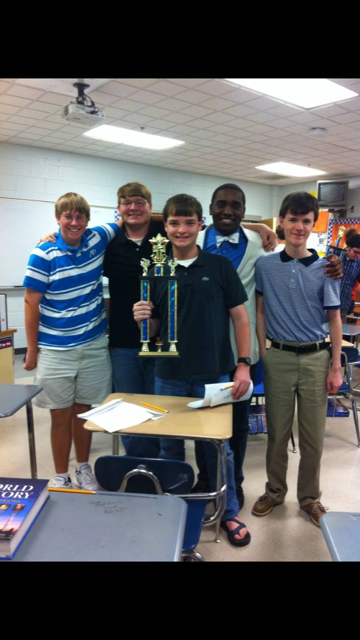 Last weekend, the Meridian High School Academic Team came in 2nd place at a statewide competition. Now, here is where the press release ends and my words begin…. Jackson Academy, a mostly white, low-poverty private school with a stellar academic reputation, was defeated not once but twice by MHS, a mostly black, high-poverty public school with a not-so-stellar academic reputation. Most people believe that schools like Meridian High are academically inferior to schools like Jackson Academy. You know it and I know it. This is what most people think. Well, the MHS Academic Team just proved most people wrong. The federal government, state legislature and state department of education tell us that Meridian High School is mediocre by giving us a “C” rating. The MHS Academic Team just proved all of them wrong. For decades, the national media, D.C. think tanks and blue-blooded political elites have fed the American people an orchestrated, false narrative: Public education has failed. This narrative has been exacerbated in recent years by ideologues who promote the false, self-destructive notion that anything having to do with government, aka public education, is bad. Yet, in one day, these five young scholars proved all of them wrong. This is a call for truth. This is not a claim of public school superiority. This is a call for community. I am a product of Mississippi's public schools. This entry was posted in Uncategorized and tagged #edchat, #edreform, #education, #K12, #meridian, #mississippi, #mississippipolitics, #msleg, #politics, #privateschools, #publicschools. Bookmark the permalink. This is an awesome story! It’s just the type of encouragement that our children need. I can agree that Meridian High School has changed over the years, but these five young men have proven that there are educators and students who still believe in academic success. Not only does MHS produce gifted athletes…more importantly, we we produce leaders and scholars! GO BLUE! Kisha, I graduated in ’94 and I can tell you that MHS has changed for the BETTER since we were there. This story is just the tip of the iceberg. Proud of these students!!!! Hats off to the teachers that prepared them for this moment!! Goooo Wildcats! !